Sometimes the Blues can be fun too. I first came across Big Boy Bloater early in 2012 when I saw an out of date poster promoting a gig of his and was intrigued by the name and some of the ‘claims’ on the poster, but forgot about him until a couple of weeks ago when our paths crossed again on Twitter; when he defended me in an argument; (Me arguing? Who’d have thought it?) 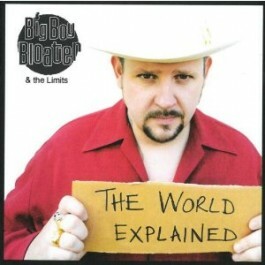 after introducing ourselves Mr. Bloater subsequently forwarded his latest release. As I unwrapped the disc I noticed the first track was titledLeonard Cohen; which I thought both odd and brave; but the opening salvo whetted my appetite and the actual song is a winner as Big Boy tells us about life on the road and all of the temptations that it encompasses, but his low moan of a chorus “and all the time Leonard Cohen’s staring at me” let’s us know that our hero didn’t succumb to these many perils. The Blues comes in many formats and fans have their own favourite styles and Big Boy Bloater presses all of my buttons with his party flavoured Rhythm AND Blues that could and should come from Chicago but actually originate in the UK. Big Boy can certainly play a guitar and he has a gravelly, charismatic voice that screams ‘listen to me’ plus his songwriting is first class too. She Gets Naked For a Living takes a left-turn from normal subjects; as we hear the tale of a young woman who has to earn a little extra cash as a stripper on a Friday night; with the seedy side of this lifestyle exposed in lines like ‘Three minutes shaking what you ain’t got /Don’t make a career’ as a Hammond organ wails over some mournful guitar licks and Bloater’s deep dark voice makes you believe it could even be a true story. The slightly stalkerish I Can’t Forget About You has everything you want from a great song; with a great tune, lyrics and a singer who believes every word he’s singing. Even if Big Boy never recorded another song he will/should be remembered for Double Whammy; which is the epitome of latter day R&B as he creates a new dance craze while knocking the Hell out of his Whammy bar on his Stratocaster; even I had to do a shimmy when I heard it. For once; all 10 tracks on THE WORLD EXPLAINED could be released as singles and each deserves radio play in their own right; if only radio stations played music as good as this any more. Buy it – you won’t be disappointed.